A friend stopped by and chatted for awhile, and as we talked, she was facing the bird feeder. I turned around to see, and sure enough, there it was. The thing was almost empty so the finches had given up squabbling over the seed and all but one had gone somewhere else and with their aggressiveness out of the picture, the nuthatch had flown in. The one house finch seemed to question its presence a second but the nuthatch shrugged it off. Hanging upside down, it reached in and fetched itself a safflower seed and flew off in success. He opened the cage and that squirrel made a mad dash away from the oak, straight down the hill, across the busy road, and scrambled at long last into a comfortable suburban backyard like where he’d come from. Okay, that didn’t work. Walking out the door a few minutes later, I wished out loud that she’d gotten to see the Cooper’s hawk to get the full experience around here. Dang if right on cue, looking at the big pine across the street, guess what flew upwards and then started kiting right there above the neighbor’s house? We laughed at the utter randomness of the timing. Well, there you go! Wow! Wishing for it to come on over for a close up was a little much. It tipped its wings at an angle and disappeared into the wind. So now there will be a scientists’ march on Washington, and one expects that all those who believe in science will be with them in person or in thought. One must be prepared for such things: and so, the brain hat pattern. Please pass it along. Less visible of a statement and more of maybe an in-joke (if joke is the word) but certainly a cool project would be the double-helix DNA scarf that I remember its creator knitting for her thesis advisor while working on her PhD, back in our Knitlist days. The second meeting of Stake Conference was this morning. One of the last speakers was a man who was born in Korea. His father came from very difficult circumstances and, trying to make a better life for his own family, took a job in Tehran for several years to be able to send money home, having to leave his wife to raise their new baby and toddler alone but at least he could provide for them. At last she was able to bring the children to go see their dad. Right as, it being the mid-’70s, Iranian assets were frozen. The family could not get to their savings, they could not get home, they had no job to go to if they even could, and from what I understand they could not so much as go buy food–they were completely stranded. A Mormon family in Utah took them in and their teenager gave up a bedroom so they could have a place to sleep. The man telling the story was four and a half at the time. He went on to say that he and his sister got a good education, everybody was safe, everybody’s circumstances are comfortable now (and he lamented that his own children had no way to understand just how good they truly have it) and they owed it all to the great generosity of those individuals who took them in and to this wonderful country which had let them come; he was so grateful. It was clear he had spent his life seeking to live up to the chances that had been offered him and to give back. I was a stranger and ye took me in… He was overcome a moment. After he sat down, the Stake President stood to give a few final remarks. He stated, first, “That was not political.” The crowd chuckled a little, and he explained: they had planned this meeting six months prior. And yet here we are. Patrick Kearon’s talk last April to the church and the world at large summed up his experiences with, This moment does not define the refugees. But our response will define us. …This post typed as a longtime friend’s husband, naturalized as a US citizen most of his lifetime ago on a dual citizenship, is stranded in Iran not knowing when or even if he can come back to his own home to see his US-born children and grandchildren again. One single skein. And then another. On my way out the door to Al’s memorial service I stopped a moment, looked at the finished cowls in ziplocs, and one leaped out at me and into my purse as if the others didn’t even exist: that one. It had been sitting there waiting to be discovered ever since I’d made it. I even ran the yarn ends in recently in anticipation but had put it back away–it wasn’t its time at the time but now maybe it was. Talking to one of his grandchildren afterwards whom I’d met when she was a little girl, she was wearing a blouse…and the blues were a match. Well there you go. From me and her grampa, with love, since she used to see me sitting knitting waiting for my girls to come out from their music lessons with him. Tonight we went off to a semi-annual Saturday evening church meeting, and the local Mormon mission president and his wife were among the speakers. Now, my brother and he were great friends growing up together and her grandmother was my sister’s favorite teacher at church and I’ve wanted to knit for her for several years now before they finish their assignment and go home. Which is coming up. I just never know when they’re going to show up because they float between a lot of different wards. I was still wearing that other blue. So I asked her afterwards if she liked the color. Why, yes she did. Could I, then…? She was quite surprised and quite delighted, and started to say something to the effect that but then you won’t have–and I laughed. “I’m always knitting.” Matter of fact, right there in my purse was yet another cowl. And it was, fancy that, a near shade of blue to hers. So there you go. It felt good. It felt really really good. That’s why I make random cowls, because they like to run out and go play just like that. If she were selling them I would link for her but as far as I know she doesn’t. Her son does construction and remodeling work, and someone had a chandelier they didn’t want anymore. Those pieces of crystal were too pretty to simply–throw away? I mean, how does one do that? And so in her hands they became jewelry and she was sharing them with her co-workers. Kind of a golden Golden Gate Bridge look to the sparkling inside. 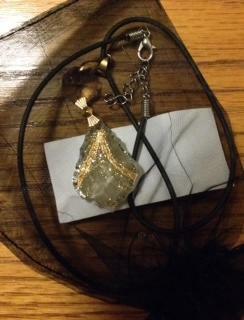 So I guess this is a pendant pendant? The two black velcro ties holding my right pinky and ring finger together are officially history. I had the baby blanket project in my lap when the quite-young doctor came in to review the new x-rays–the heavy project he’d specifically told me ten weeks ago not to work on for five weeks and then when the hand still wasn’t fully healed I think it was supposed to be just assumed that knitting would still be on hold for five more. Yeah good luck with that one. The first five were eternity enough. I told him of my elderly friend who had lived to see her baby tree produce, how good her pomegranates were, and that I had planted my own this morning–and I couldn’t resist adding that I’d pulled a whole lot of old gravel away down to the good soil (and had replaced a wide swath of it with more good soil.) I’d marveled that there was any possibility that this little thing could possibly come to provide the harvest Jean’s had in such a short period of time but I was willing to find out. And clearly there was that baby blanket and it was not a small thing. He laughed and said it was pretty and added something to the effect of, clearly you’re going to do what you’re going to do. He did make sure my hand had been okay with all of that. Well, yeah, mostly (shrug). That got a grin out of him. He made me promise to come back if there were any problems. What I didn’t say was the careful untangling of the tightly felted roots once they were out of that plastic sleeve and the fact that I’d planted the tree three times: no, that’s not quite it (dig), that’s… umm, almost but (dig) there, third time’s the charm. That’s how I wanted it to look from over here as it grows, got it. That’s it! There is such an element of joy to starting a creative project that will still be creating and giving of itself a hundred years from now. I can just picture the young doctor and his wife descending on Yamagami’s after my enthusiasm: What was that variety? Parfi..? Parfianka…? Yes, that one! Where a gravel pathway was laid down, oh, 50 years ago or so, the rocks run deep. And then there was that tree trunk. When we cut down a bunch of scraggly trees and started relandscaping a few years ago I had the tree service leave this one tall stump at over six feet–I wanted the Ladder-Backed woodpeckers to be able to have old dead wood to find bugs in. I never saw a woodpecker touch it but the squirrels sure liked their express lane offramp from the fence. Various birds liked to play king of the mountain on it to scope out the view of their feeder. About a month ago I kind of toggled the thing a little, thinking it should be well rotted by now and better to take it down than to have it fall. I’ve wanted a pomegranate tree ever since our friend Jean shared from her two-year-old one last year. She had planted it at 88 and gotten to share the fruit. I had never before tasted one picked when it was so ripe that the thing had started to burst open; I know it partly depends on variety (she didn’t remember what hers was) but I’d had no idea they could be like this. If we were going to start our own, this is bare-root season. Yesterday I worked down through all that gravel–it went to nearly a foot–and started turning over bare soil below at last. And asked Richard when he got home what he thought about that placement. Your house too. It needs to make you happy, too. I reminded him that I’ve wished I’d planted the Tropic Snow peach a few feet further right and it was too late now and I didn’t want to make that mistake again. I wanted to do it right this time. Today I went off to Yamagami’s. The Parfianka is a taste-test favorite and has seeds that are both quite small and quite soft–meaning, okay for me post-op, and it helped that one of their staff had previously told me it was his favorite. When they saw me with my walker, one of them dropped what she was doing and took me right to where that particular variety pomegranate was, and then, seeing that it would be hard for me to do, she not only pointed out good specimens but reached to the back and pulled several out from there as well as the front and put them down on the ground in a row for me to choose from where I could see them all individually. She helped me get a really nice one, and had I been on my own I wouldn’t have been able to risk reaching for it for fear of losing my balance into the lot of them. I was and am grateful. That stump was in the way of digging where Richard wanted this to go–and you can’t risk having it fall on the new tree, either. I thought, after all the rain we’ve been having, maybe it made a difference? And again I tried giving it a tug. It came away, not in a fast collapse but rather slow and measured and easy to aim. Well THAT worked! With that out of the way I started pulling away rocks again. And it was fascinating: just a few feet away, yesterday’s had been jagged. Most of these were smoothed, rounded, far easier to deal with. Still, it was a lot of work and enough for one day. And I’m glad now I did two holes because both will have good soil for the tree to grow into. Pleased at the depth and width, I declared it done and went off to get Richard. Tomorrow the prime planting soil from Yamagami’s goes in. 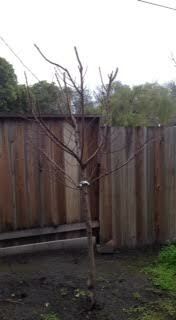 Tomorrow I plant my new fruit tree in Al’s memory. I can’t wait to tell Jean. Sunday, when I told Eric’s story about his marathon, I typed that little thought at the end. Then I started to delete it. I didn’t want to take away from what he’d said and I was afraid it might. But if… And I didn’t. Then again… But I left it. I second-guessed myself all the way up to bedtime and wondered who I’d written it for. Well, me, as it turned out: because even though the hailstorm was over by the time I got to the audiologist’s, it was raining off and on (on, just then) and I did not want to bother with struggling to get the walker out of the back of our small car–it’s not that it’s heavy, it’s that it barely squeezes in and out of the trunk without some wrangling to get the angles right coming and going and I didn’t want to bother in this weather. So I just grabbed the cane in the back seat and made do. It being my first time there since the latest head injury, John-the-audiologist had never seen me that wobbly, and I didn’t have the walker to steady my balance by. I told him about it and that I’d come a long way since and that I was fine sitting down. Which he could tell, because by then I’d been sitting in his office just peachy-fine for awhile. But it was when I stood up to go that he got worried, more so when I admitted I’d taken a tumble into a nice cushioning (except where I’d pruned it) bush that afternoon. He wanted to offer me an arm not just to the door but clear to my car. Just as the skies threw a new bucket of cold water on that idea. I started to brush him off with, You don’t have to do that! Wait, I told myself–what did you just write just last night? Were you listening to yourself? You know you should have gotten that walker. And I realized that all that internal fussing over that blog post had helped me remember how I needed to see this. Let him be his best self, willya? John had no raincoat on, not even a sweater, but good man that he is, he made sure I was in okay before he dashed back towards his nice warm dry (which he was not now) office. I was glad that at least I’d gotten a decent spot close in for his sake. Drove through a cloudburst that was quite the hailstorm, than an underpass on the freeway where the day’s rains had collected to too deep for comfort. Traffic actually slowed down to a responsible slow crawl through the whole thing. My audiologist likes to check the hearing aids every six months to make sure everything’s in good working order. My question to him, was, Given what these cost and that the three-year warranty just expired, is there an extended warranty I can buy? His answer surprised me, so I’m putting it out here in hopes that someone who needs the information finds it. He told me, Yes, the company sells one, but the costs are very high–you’re much better off contacting your homeowners insurance and asking for a rider specifically on the aids. That would never have occurred to me, and given that I for one am not in a hurry to pay a third of a Prius towards my ears again anytime soon, I thought I would put that out there. Then he handed me a bluetooth pendant, clicked a few clicks on his computer, and presto! One more dB in the uppermost frequencies of speech per my request, done! That new guy who looks like my sister’s identical twins spoke in church today. When he was a student, he’d decided to do a semester abroad at the BYU Jerusalem Center. It turned out a local marathon was going to coincide with his semester there so he decided to train for it and make that part of his experience, too. Well, come the day of, he maybe wasn’t quite as prepared as he thought he was, he said, and he thought that by starting off fast and staying fast he could get through the race in less time. Mile after mile… He passed people stopping at way stations to eat a bite and was glad he didn’t need to do that–it would wreck his time. Till at last he found himself collapsing on the side there, unable to take one more step, really not feeling great, thinking his friends would finish and come back and pick him up. He was surprised at how wiped he was and he felt like he’d failed. And so there he was; he said it felt like a very long time but was probably only five minutes or so, when a stranger came to him to see if he was okay. He clearly didn’t look okay to him. The man talked to him, but he was a Palestinian and our college student didn’t speak Arabic and shrugged, Sorry! He watched the man then cross the street to a vendor and come back with a sandwich. You need this. Eat this. The moment transcended the language barrier. Eric finished his talk by reading the parable of the Good Samaritan, with feeling. And I considered the thought that sometimes we don’t even know we need to be helped. Until we allow someone to do so. The seats were all filled over on the left where the knitters I knew were. There were several empty ones on the back row on the right, and I sat down at the end there, ready to scoot over as needed. There seemed to be a lot of family there and they should always have the best seats. He was about Parker’s age (Parker is in kindergarten) and he came in with his daddy and they sat down two rows straight ahead of me before the service started. Since I wasn’t interrupting anything yet, I reached into my purse and thought, hmm, not that…ah, that one. Perfect. We’ll call it a California condor, even if it was knitted in Peru. I offered it to the dad and both he and his little boy turned and said thank you. As the music and speakers began, the little boy played quietly with it rather than in grand sweeping motions: he had been well and lovingly coached in what was expected of him at his great aunt’s funeral–and he really liked that condor. At some point they got up for a minute, and before they returned one of their two seats was taken; there was still an empty one there at the back, though, and the dad had his little boy come sit down by me. Where he again was very quiet for a very long time, his daddy beaming behind him at his adorable little boy. My impression was that it was easier on the dad’s body to be standing than sitting. But at last Justin, if I heard his name right, looked up at me and with big questioning eyes said something to me that I had no way to know what it was. I had my hearing aids cranked up. Nope. I told him the condor was for him to have, and that made him happy, but something else was still on his mind. I tried whispering back the ever-helpful, I’m sorry but I can’t hear, while pulling a hearing aid out to show him, but he didn’t yet have enough life experience to understand what that really meant. I did catch the eye, though, of the young girl of about ten on the other side of him and tried to convey the thought of, would you mind helping us out a little bit? Covering for a deaf grownup’s shortcomings wasn’t her specialty yet, either. She gave me a friendly smile but had no idea what to do. He whispered something else and I whispered back, I don’t know. Oh okay and he turned to her. What he’d wanted, it turned out, was a bathroom. And I was one of the very few people in that room who actually knew where it was. Oops. Diana’s brother who’d set up the venue was a Mormon but my understanding is that he lives nowhere near California and we were at The Annex, a stately old reception hall that had come with the property when the Mormon Church had bought it to build a chapel on the lawn in 1950 or so. My son’s wedding reception had been held there. I knew the place. I also knew you had to climb some semi-hidden stairs to the far right over thataway as if you were going to go up into an attic–it is not intuitive. That all got taken care of, the speakers got done speaking, the final song was sung and the closing prayer was offered. And then Justin stood in front of me, wanting to ask one more thing. (And he didn’t have to whisper anymore.) He had seen that I had more finger puppets in my purse: what were they all for? I have grandchildren, I answered, wishing I could swoop him into a hug as if he were one, too. Such a sweet child. He asked, in wonderment, Are they all for them? (And I realized I had just restocked so I probably had several dozen in there. The finger puppets are small and light, the purse is big, things easily disappear into the depths, so, the more the easier in there.) I said, Well, sometimes like when I’m at the grocery store or at the doctor’s office I’ll see a little kid who is unhappy or crying. And I give them one and then they’re happy! Oh! he said, patting his condor he’d tucked into the little pocket on his white shirt, its head peeking out at the world. He was going to make sure that if he saw any little kids who needed to be happy he’d take care of them. He did not ask me for more. He was willing to share his. I love that yarn stores across the country were reporting shortages of pink yarn, and that Malabrigo dyed extra due to the demand, sure that it could not arrive in time but people were asking for it anyway. I laughed at reading that the chunkier yarns went first. Well, yes, you can knit those faster. The original pattern, for which the New York Times said Malabrigo Rios was the recommended yarn, was as simple as it gets: knit a length with ribbing at the ends, fold it in half and sew the sides and let the ends of the square stick out for the ears once you fit it over a round head. The beginneriest beginner can do it. I loved the photo someone posted of a planeful of women on the way to the march in DC, some with their hats on for the camera. I grew up in the DC area. I remember the marches and the hitchhikers along the roads afterwards, the sense of being part of history even as an onlooker. I fervently wish I could be there, heck, I wish I could be at the local one but I just cannot risk the sun time with my lupus. Not to mention that my friend Diana’s memorial service, saved for after the holidays so that people would be able to come, is tomorrow. Diana herself would have changed the date in a heartbeat had she known about the march but it is what it is and I will be cheering her on her way and her loved ones in their grief. And that is how we create the changes for the better around us: one person at a time in each moment as it comes and to the best of our abilities. I love that Kate at Dragonfly Fibers, in my husband’s hometown of Kensington, MD, posted a picture of 1,500 donated handknit hats, many of them with a note from the knitter to the wearer. She had volunteered to be a distribution point. These had filled her van and she had that many more to put in. Every single one has been spoken for now. I love that the project has sparked an interest in knitting nationwide. I love that some entrepreneur designed one fast and got it out there with more realistic ears, mass produced, even if it was $35 and they’d forgotten in their rush to even say what the fiber content was. (So, probably acrylic.) The more hats made, the greater the chance that everybody could have one. I just couldn’t quite love the idea of putting the Donald’s worst denigration of women on my own personal head. But after the marches tomorrow, I imagine every one of those handknit hats (and maybe even those manufactured ones) is going to be a treasured family heirloom and a proud story for the great grandkids to come. I imagine the knitters of the donated ones and the wearers finding and befriending each other, having already together promoted the ideals our country stands for. I just so much love that everybody’s doing what they’re doing. I got requests, and then more requests, and then I would have had to make three for those guys and then for these other guys too and and and there just seemed to be no way to do it right–my heart was with them but if I stopped knitting the afghan I might never return to it. It was a little overwhelming, knitting-wise. I bailed. I finally wish I’d at least made one, too. Green Planet Yarn had a meet-and-greet today: TNNA, the Stitches-type get-together for wholesalers and yarn store owners, was going to be here this weekend and thus the owners of several yarn dyeing companies had agreed to come to Beth’s shop with samples of new lines and just to get to meet some of the people who actually use what they create. It wasn’t just that I wanted to see the yarns: I specifically wanted to thank the folks at Blue Sky Fibers. I’m sure I’ve told the story here before, but not recently I don’t think, so here goes. 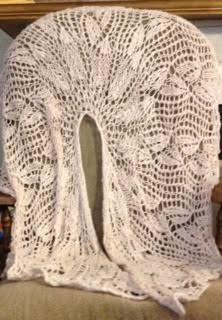 I was in the early stages of working on my lace shawls book. Meantime, Stephanie Pearl-McPhee was coming to Berkeley for her first-ever book signing in California–Stash, I think was the name of the place–and Jocelyn and Cris and I carpooled together to go. After knowing Stephanie via the Knitlist since our kids had been little, I finally got to meet her for the first time. Stash did a brisk business in books and yarn that night, and I came across some Blue Sky baby alpaca/silk that was both new and like nothing else out there. Wow. SO soft. Luminous, too, just gorgeous (and it is still one of the nicest yarns I know, all these years later.) I snapped up two skeins but definitely needed more to make a shawl. Please, they told me: we know we have more of it in the back. We’re swamped. Can we just mail it to you in the morning? I got a very embarrassed phone call the next day: no, actually, they did not have any more, and there was about zero chance of getting an exact match on the next order. They were so sorry. And that set off the great yarn hunt. I needed more and it needed to be that dyelot. There weren’t as many yarn stores online then nor that carried that particular yarn, but I called a few and emailed more and did what I could. I’d seen ads in Interweave magazines for a particular shop back East that seemed to have a good inventory, and they said they would check and they asked for my phone number. It did not occur to me to mention to them that I was three time zones away. And thus the infamous story within the family of their starting the day by making sure I knew before I should head out for work that I had to keep looking. Richard groaned awake in the dark, one of many times when being able to take my ears off at night has been nice for me but for him, not so much, and he reached over my head for the old Princess phone placed there on the small chance I might hear it ring if I really really had to. At that, I gave up and appealed to Blue Sky directly: did they have it? I was quite sure they didn’t do retail, but could I buy it from them anyway? They actually had an exact match. I asked for two, they sent me three, and they refused to let me pay them a dime. Even when I protested. I thanked them but it didn’t seem enough. Today was my chance. Linda, the owner, was not there, but three of her staff were. As I found them one by one in the crowd, I showed them the shawl that had come of their generosity and gave them each an autographed copy of Wrapped in Comfort. Each one, independent of the others, asked to see what page it was on. They let me tell them what a difference they’d made to me and were delighted to take a fourth copy home for Linda. And noticed that one guy had been standing off by himself for awhile now and nobody was talking to him. Well that wouldn’t do, these things are supposed to be fun. Turns out he wasn’t a knitter. Turns out he was Michael, a businessman who was the husband of the Mrs. Crosby of Lorna’s Laces fame. And as we talked, old friend and Green Planet employee Laura came by with a bag and offered me my pick. She worked the room and then came back towards me with another bag. The first was a skein of Woolfolk from Blue Sky. The second was a bluegreen one-off dyeing of Shepherd’s Worsted from Lorna’s Laces, and I exclaimed to Michael over his wife’s beautiful work. And then the event was officially done and it was time to beat it home quick before the next downpour. Forty to forty-five mph winds and a total deluge of water all at once. It sounded very much like being back East when a hurricane is coming at you. The water in the street was a fast river, rushing wave upon white-crested wave of water–and we’re on a dead end street. That had all come straight down from the sky. Whoosh! What looked like a tiny tornado touching down made the water suddenly twist and kick up high in one spot and it splashed back down in a twirl. So I wrote about it on Facebook and within twenty minutes it was like a toddler with his fingers in his mouth looking up with a half-innocent smile, going, Who me? It was still raining but nothing like that. The resident former Red Cross Disaster Services volunteer says that a third of an inch of rain in an hour causes flood advisories here. We’ve had close to an inch today with half of it dumped out in that one big fast blast. We have four more days of heavy rain and two after that of the storms petering out. Remembering the storm of ’98 when Richard and Sam manned the Red Cross shelter, where a friend of mine was after having woken up in the night to find her bed at the ceiling. When kids boogie-boarded down the street. We are happily on a rise, outside the flood plain nearer the Bay, and not close to a creek. Something this newbie learned this past year (I should have asked Al first): don’t put birdnetting over a standard-rootstock fruit tree. That’s what my Indian Free peach is because that’s all that variety came in from the grower, which means it gets very tall very fast. Which also means it quickly got caught up in and strangled and twisted by that birdnetting, and getting to the branches without destroying the netting before harvest thus defeating its purpose proved impossible. And then the tree kept growing like crazy, lifting the black mesh well out of reach. So the tree didn’t get its summer pruning but it needed it more. The larger critters tore the netting open in the night and got my peaches anyway. So much for that. The plastic produce clamshells worked much better so I am definitely going back to them. This year I will staple paper bags over them to hide sight and smell of ripening fruit with a little hot pepper at the bottom in case they try anyway. Thwart one, thwart two, thwart three. My pruning shears were not enough for this one–I had to get out the pole pruner. I didn’t think to take pictures before, and after over an hour at it the sun was too far gone. But I do have that tree Ground Hog Day’d to a year ago. More or less. It looks much more robust than then. To prune, you have to look at each branch: there are tiny buds, and where they are on the limb shows you which direction the tree will take it after you cut right above one. You want it to go left? That one pointing left. Right? The one down here. None facing exactly the right way? Probably not quite as much sun that side. What I wanted most for it to do was to grow over the fence towards Adele, even though I cut off half of several branches that were already close to doing just that. But they were too young and too flimsy; they needed to thicken before getting too long, otherwise, they could break from the weight of a single fruit. I voted for Most Likely To Succeed and trimmed them back by half. I also wanted there to be ones far enough down, height-wise, for her to be able to get to when they’re laden with ripe peaches dripping with juice. Off with its heads. Out not up. Two trimmings in particular, I was curious and stood them upright on the ground. They came up to my nose. 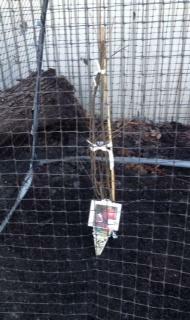 Here’s the story of my planting that peach for Adele. And wow, that picture, it was so little two years ago.